© Posted on April 16, 2018, by Michael E. Newton. Previously I wrote about Alexander Hamilton becoming a trusted clerk at the mercantile partnership of David Beekman and Nicholas Cruger prior to April 1767 and that “it would not be unreasonable to assume” that he began working for the company in 1766. The date of Hamilton starting his employment with Beekman & Cruger remains uncertain and may depend on when the two partners arrived on St. Croix and started their mercantile operations. Until now, this was the earliest known record of Beekman and Cruger on St. Croix. Ramsing also noted that the firm and its two partners are “first noticed on the poll-tax list from 1766,” which for Kongens Gade (King’s Street) was compiled on January 5, 1767. 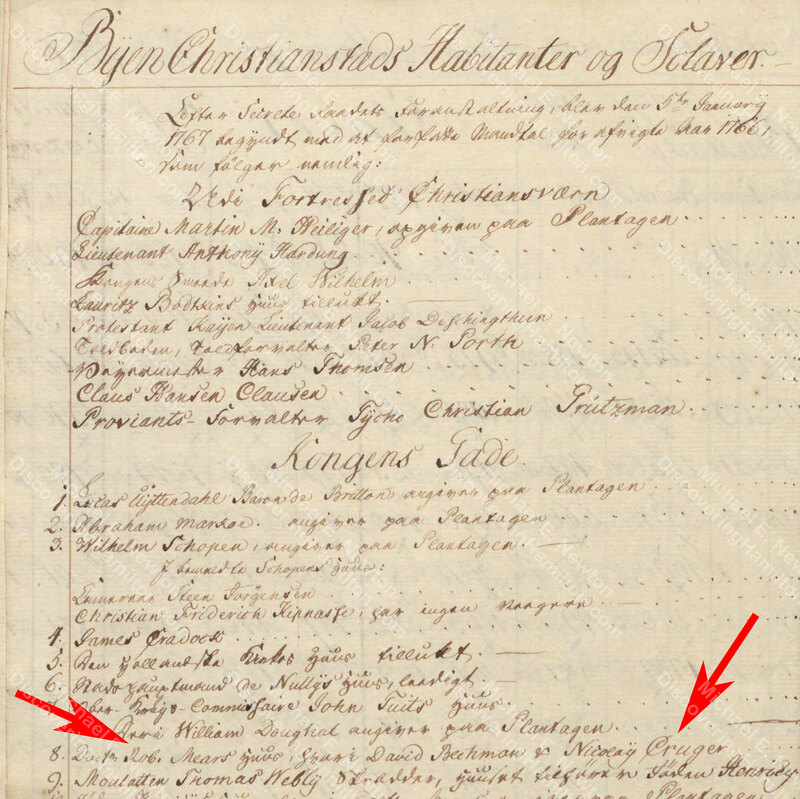 Neither David Beekman nor Nicholas Cruger is found on Kongens Gade in the 1765 matrikel compiled for that street on January 13, 1766, nor anywhere else in this matrikel. Accordingly, they must have taken up residence and opened their store after January 13, 1766. Thus, based on H. U. Ramsing’s discovery of the above bill and the above matrikels which Ramsing also noted, it would appear that Beekman and Cruger arrived on St. Croix and started selling goods sometime between January 13 and April 2, 1766. Voyage to St. Croix Dr to Cash for our 1/6 part of sundries shipt on Snow Mina [Minerva] Jno Clark Majr Consign’d Beekman & Cruger / in Co with ye Owners as pr Invoice . . . £129.16.10. Clearly, Beekman and Cruger had formed their partnership by this date, but this was recorded in New York, not in St. Croix. Were Beekman and Cruger still in New York at this time? Or were they already on St. Croix? On January 18, 1766, “John Clarck af Nye Ork [New York],” the same John Clark mentioned in Henry and John Cruger’s waste book, was entered into Christiansted’s custom journal. The custom journal records that Clark was importing 8,475 rigsdalers of goods “for Beckmann & Cruger.” John Clark also imported two slave men, presumably for Beekman & Cruger and probably the two capable slaves they owned in January 1767 according to the 1766 matrikel. Based on these records, it appears that Beekman & Cruger were on St. Croix and had begun operations by January 18, 1766. But we must recall that they were not listed in the matrikel that was recorded just days before this. It thus appears possible, perhaps likely, that David Beekman or Nicholas Cruger, maybe both, arrived on St. Croix on January 18, 1766, aboard John Clark’s snow Minerva. One assumes that Beekman & Cruger, around this time, opened their store on Kongens Gade (King’s Street), for they needed a place to sell the goods they had just imported and were found at this location the following year. Since it must have taken at least three weeks for David Beekman’s letter to travel from St. Croix to Philadelphia and then on to New York, Beekman must have arrived on St. Croix by the middle of February 1766. This confirms that David Beekman, and possibly Cruger as well, arrived on St. Croix in January or early February 1766. This also supports the theory that Beekman and Cruger arrived on board John Clark’s snow Minerva on January 18, 1766. David Beekman and Nicholas Cruger were not on St. Croix as of January 13, 1766, or at least had not yet taken up residence or opened their store, because they are not listed in the 1765 matrikel. The earliest record of their partnership, known as Beekman & Cruger, appears in the account book of John and Henry Cruger on January 16, 1766. Beekman & Cruger received 8,475 rigsdalers of goods on St. Croix on January 18, 1766, which they had imported from New York on John Clark’s Minerva. Perhaps they came to St. Croix aboard this ship. By the middle of February, David Beekman was writing to his brother from St. Croix and one assumes that Nicholas Cruger was on the island as well. By January 1767, they were operating a store on Kongens Gade (King’s Street), but one assumes that they had opened this store shortly after their arrival on St. Croix in January or early February 1766. Unfortunately, it is still not known when Alexander Hamilton started working for Beekman & Cruger. But knowing more precisely when Beekman and Cruger arrived on St. Croix gives us a firmer timeframe for when Hamilton might have started working for the company. Gerard G. Beekman to David Beekman, March 8, 1766, in The Beekman Mercantile Papers 1:495. Michael E. Newton, “Witnessing an Appraisal: The Oldest Known Alexander Hamilton Document,” “Witnessing a Mortgage: The Second Oldest Known Alexander Hamilton Document,” and “The Oldest Known Alexander Hamilton Documents: Implications for Hamilton’s Biography,” all found on DiscoveringHamilton.com. 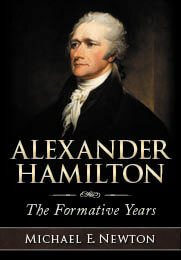 John C. Hamilton, The Life of Alexander Hamilton 1:6; John C. Hamilton, History of the Republic 1:44.